So Bloodborne is still the current obsession. If you missed our last blog post about the game looking at how blood in real life can be as healing as the Healing Church’s then check that out too: https://teatimesci.wordpress.com/2018/03/25/bloodborne-blood-magic-or-advanced-science-gone-a-little-wrong/. There will be huge huge HUGE spoilers for Bloodbrone throughout this post so stop reading now if you don’t want the end of the game spoiled! We won’t be covering any of the DLC here, though we’ve heard a lot about it! One thing we’re especially interested in is the whirlgig saw. Not just because it looks like a handy way to liberate blood but also because it sort of implies a shared universe between Bloodborne and Final Fantasy XII!!! Don’t worry we aren’t actually going to peddle that theory but the weapon does make us think Ba’Gamnan and his gang maybe tried their hands at beast hunting after leaving the bounty hunter game behind! Today we’re looking at a couple of theories about the game. They both revolve around the most infuriating plot twist ever: it was all a dream. So the first theory which most people will have heard of, is sort of even implied in the game, and which they likely thought themselves at some stage, is that all of Blooborne is a dream. This is backed up by the fact at the start of the game your character blacks out and only then do they start seeing the monstrous beasts. It’s also supported by the Hunters Dream pretty much literally being a dream. Now Gehrman is the first hunter, he literally ran the original order of hunters who’s task it was to keep on top of the growing infestation of beastified citizens of Yharnam. In the game you can find his ‘real’ workshop, where he developed lots of the kits the hunters used, in the cathedral ward. It looks exactly like the hunters dream, even down to the doll who was seemingly Gehrman’s only companion he cared about. Of course this version of the doll is a lot quieter (just like the one the player interacts with is before you gain some insight). In Gehrman’s original workshop you can also find a third of umbilical chord. This is from a great one and is known to give people insight and actually help them ascend to a higher plain so that they can join the great ones who ascended before them. It seems likely that Gehrman didn’t just keep it around for decoration (he had all the creepy graves for that!) and likely it allowed him to at least communicate with a great one. Reading between the lines, the result of this chin-wag was the Hunters Dream. A place where Gehrman could continue doing his work helping hunters and a place where his doll could have life. People in a deep enough sleep can be pulled up into this higher plain to take part in the hunt as long as they’re asleep. All of this was possible because the Moon Presence allowed it and this link between the Moon Presence and the hunters dream is precisely why he can appear there to face you at the end of the game. The result of this meeting is either you hosting the dream since Gehrman has awakened or you killing the Moon Presence and becoming a baby great one yourself to take your place permanently in this higher plain of existence! Why has the Moon Presence gone to all this effort you ask? So that hunters can go and kill other great ones. You see the higher plain that the great ones have ascended to is actually this dream / nightmare realm. In fact we’re pretty sure most of the events of the game take place in a realm of Amygdala’s design. In case you didn’t twig it, Amygdala is the great one you fight in the Nightmare Frontier and seems to be the most revered by the Healing Church as it resembles most of the statues scattered everywhere (seriously, the stone masonry trade in Yharnam must really be booming!). We think it’s pretty likely the Moon Presence helped Gherman make the Hunters Dream as a base to go ahead and attack Amygdala’s nightmare realm in some great one power play. So that’s some game lore, combined with a bit of theory but it’s actually the science behind dreams and nightmares that helps support these mad ideas! So what is the science behind dreams? Well sleep isn’t just sleep. There are actually four stages of sleep. First is onset, then light sleep, the last the stages are associated with deep sleep with stage showing rapid eye movement (REM) sleep. These stages are all different with the differences really being in brainwaves. But overall you can think of sleep as being when your brain rests itself by going through a specific sequence of brainwave states. So brainwaves are what we call the electrical impulses that pass through your brain. They’re pretty important as electrical impulses through neurons (cells) in the brain are essentially your thoughts, memories, consciousness – it’s pretty much you in a nutshell (or in this case a flesh-shell). Different brainwaves have different names but they are all measuring the electrical impulses. The difference between each type is the frequency of the impulses and these vary depending on your state of consciousness. So REM sleep is important for what we’re talking about because this is the stage that you tend to dream during. As you sleep you cycle through all the stages and the more cycles you do the longer the REM stages become. Now here’s the important part in regard to the theories about Bloodborne. When we are in REM sleep and dreaming a lot of the brain is active. One important part of the brain is the amygdala. Yep you’re reading that right. 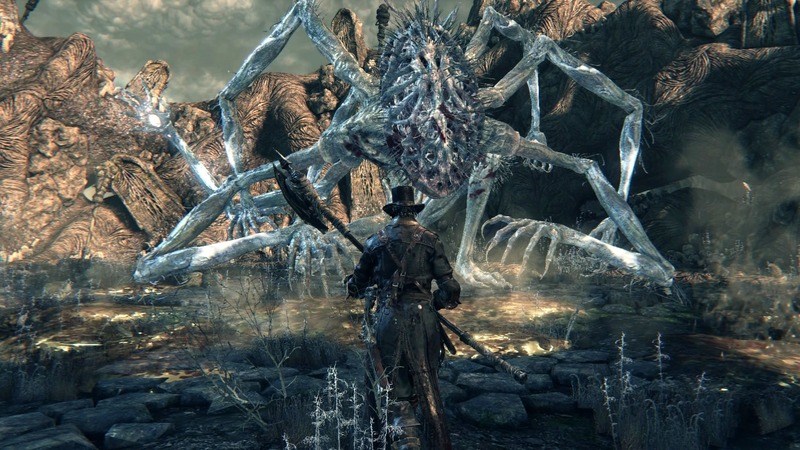 That giant multi legged monster you face down in the game is named after part of your brain. Coincidence? We think not! Anyway, the amygdala can be seen very active whilst people are dreaming by using imaging techniques. These techniques include CT and MRI scans and often use x-rays, or magnetic fields to build up images of the brain and what’s happening inside. One of these is functional MRI, and works by actually measuring the levels of oxygenated and deoxygenated hemoglobin in the brain. This is cool because hemoglobin is the stuff in your blood that carries oxygen around the body. The more an area of the brain is working, the more oxygen it will use up. The more oxygen it uses up the more deoxygenated hemoglobin there will be in the blood and this will highlight those area in the scan image. When these scans are done during dreaming the amygdala is highlighted. In fact it is thought that over activation of the amygdala is actually the cause of nightmares. This is why people tend to have more (and more severe) nightmares when they have been stressed or scared. So now we know a bit more about what causes people to have nightmares, the theories earlier don’t sound quite as crazy (well they probably do but still). The parallels of the amygdala in your brain causing nightmares and the possibility that the whole nightmare of Bloodborne being caused by Amygdala the great one just seems a bit too accurate. Now we’re not saying the Moon Presence is trying to help people stuck in the nightmare, that just wouldn’t be depressing enough. More that it’s a Cthulu style battle between unimaginable evils where the player (and all the people in the game) are just pawns. Hopefully we haven’t just ruined the game for everyone by making you imagine a squishy brain part every time you fight Amygdala or see any of the other things that look like it. But it’s head does look a lot like the almond shaped brain amygdala. Thank you as always for reading, hope you enjoyed, and please leave us any comments you have on the post 🙂 You can also find us on Twitter and Instagram at @TeaTimeSci if you want to get in touch or just see what else we get up to! Next Annihilation Made a Man-Bear-Pig to Annihilate Viewer’s Nerves!